Age truly is just a number. You’re only as old as you feel. When I see training videos of 2008 Mr. Olympia, Dexter “The Blade” Jackson, doing pulldowns with the legendary Charles Glass behind him, that’s straight-up bodybuilding royalty. When you stop to think about the fact that Dexter started back in the early 90’s, how he defied the odds and went pro, and how he continues to compete, besting guys 10, 20, even 30 years his junior, it’s truly mind-boggling. For years, in the past, I was one of these journalists who thought it my place to suggest that Jackson should consider retirement (because of his age) and every time I made such a foolish assumption, Dexter would place among the Top 6; in fact, in 2018, it was the first time in recent history, that Jackson placed outside the six best in the world. Nonetheless, how many guys can go to the greatest bodybuilding contest on Earth, in their 50’s and take 7th place? The answer is, not many, not most!! And while some guys who have been at the top can’t process anything less than 1st place, others use the experience to really bring them back to reality; I mean, there’s a great many, top tier physique-based athletes who stopped working to their capacity. Unfortunately, once certain guys hit their peak, or the highest they’ll ever go, they just stop caring as much. That, however, has never happened with Dexter Jackson. When The Blade enters a contest, he’s going there to win – and anything short of that, isn’t anything to celebrate about, but it does create inspiration and reflection to get better! Just recently, I saw a video titled, “Road to the Olympia,” more than likely from 2018. The film takes you with Dexter as he meal preps, trains, and reflects. Everything this great champion does, is with the stage in mind. He wants to be the best and he knows exactly what being the best requires. Jackson has won 9 Arnold Classic titles, 1 Mr. Olympia, and more overall titles than any pro in history. This sort of success doesn’t just happen. But when you work as hard as Dexter does, it all makes sense. What I also really liked about the video in question, was the fact that Jackson isn’t looking to reinvent the wheel; he knows what works for him, but he’s also very quick to point out, that what works for him, isn’t going to necessarily work for you. That last bit, is key, and truly shows Dexter’s commitment to professionalism. He’s definitely the last of the Mohicans. Not only can Dexter be honest, but he’s such a hard worker, ever so disciplined, and ever so genetically gifted, that there’s no reason to lie, there’s no reason to hype himself up. I was particularly impressed with his admission that he never messes with his sodium. To us, in the peanut gallery, that might not mean much, but for the competition, Dexter may have just dropped a major piece of news, maybe something that could tip off the competition. The beauty of being where Dexter is at this stage of his career, is that even if he shared everything, the vast majority would still be unable to hang with him. In a very real way, I wish guys like The Blade never retired and I’m coming to this realization, now, more than ever. Bodybuilding continues to improve, with better supplements, new innovations in training methodologies, and even the equipment we use in gyms – everything is being improved, because athletes expect more. We also have science to consider. The more time evolves, the greater our understanding of the human body gets. 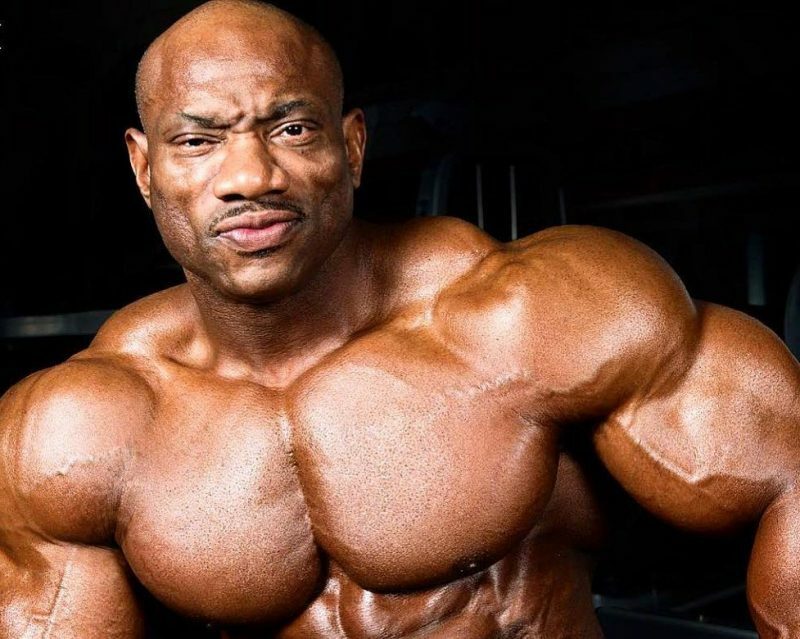 But, even all that being the case, I still look at the sport itself and I wonder what it would look like today, if there were more Dexter Jackson’s, more guys cut from that cloth. I mean, let’s count all the feuds Dexter has been involved in during his career? How many times has The Blade reinvented himself through trashing others? The truth is, Jackson has never had to lower himself to doing any of the trash-talking, rumor-spreading, or elbow-pumping action on stage, in order to get noticed by the media, cheered on by the fans, or to win the big prizes. I wish more bodybuilders took a page from The Blade’s playbook, opting to improve quietly and consistently, making smart business moves, and thinking Big Picture when it comes to their short and long-term goals – both on stage and in the fitness industry. Another good thing about Dexter’s continued presence on the sport, is the fact the youngsters respect him. He’s earned everyone’s respect from being the bodybuilder with the most pro wins in history, to winning 9 Arnold titles, to winning the Mr. Olympia in 2008. That respect is key. Age is also key, because even the youngest competitors of the bunch, respect their elders – if anything, that one old-school tradition remains. Although Dexter’s physique beats that of guys 10, 20, and even 30 years his junior, the fact he’s seen so many eras come and go, wins him even more respect. The question is, why does he still do it? Dexter Jackson has done it right. From what I hear, he’s done very well for himself – as a competitor, a coach, and business owner. Basically, everything The Blade touches, turns into gold. The real reason he continue to compete, as far as I can tell, is because he loves it. When you love something, it’s hard to let it go, and especially when you’re successful. How can anyone ask a guy missing the Olympia Top 6 by one spot to retire? Most guys who get that placing have a fire lit under them to go all the way. Placing 7th doesn’t mean you should retire. If anything, it’s validation, that you shouldn’t press on! I don’t know about you, but I’ll never even hint at Dexter retiring, again. In fact, i wouldn’t be the least bit surprised, if at this year’s Mr. Olympia, it’s Rhoden for the win, Brandon Curry for 2nd, and a beyond-words-impressive Dexter Jackson for 3rd, making both Rhoden and Curry fight all the way to the end. What’s your take? Previous Previous post: William Bonac – A Class Act!